WASHINGTON (AllPolitics, Feb. 5) -- The ranking Democrat on the House Judiciary Committee is preparing a letter asking Attorney General Janet Reno to investigate what he believes to be repeated abuses of power by Whitewater Independent Counsel Ken Starr, CNN has learned. Meanwhile, CNN has also learned the Justice Department last year rejected a similar call for an investigation of Starr saying it found "no indication ... that Mr. Starr is unable to put his personal views aside." 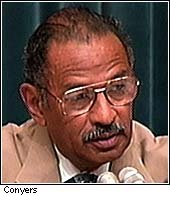 Sources said the letter from Rep. John Conyers (D-Mich.) runs more than a dozen pages and accuses Starr of a variety of ethical lapses, including allegations he has pressured witnesses to commit perjury in his effort to build a case against President Bill Clinton and first lady Hillary Rodham Clinton. A draft of the letter also accuses Starr of orchestrating illegal media leaks of secret grand jury testimony, and questions his objectivity by detailing his ties to conservative groups and activists during his tenure as independent counsel. The sources said the letter would request that Reno ask her ethics office, the Office of Professional Responsibility, to begin an investigation into whether Starr should be removed from his position. CNN has obtained a previously undisclosed letter to a leading public critic of Starr's investigation, which says allegations of political bias and conflict of interest against Starr cannot be "viewed as so extreme as to call for the Attorney General's use of the extraordinary power of removal." The February 7, 1997, letter from top Justice official Michael Shaheen, then-Counsel for the Office of Professional Responsibility, was sent to private attorney Francis Mandanici, who had demanded action against Starr by the Justice Department and by the federal judges in Arkansas. Despite this earlier refusal, a Justice Department official said if Conyers' letter is received, "It would be reviewed just as we review anything from a member of Congress." In last year's letter, the Justice Department stressed that Reno can remove an independent counsel from office only for "good cause, physical or mental disability or any other condition that substantially impairs the performance of such independent counsel's duties." 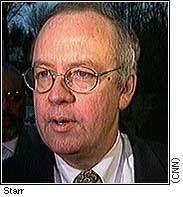 Citing the legislative history of the independent counsel statute, the Justice Department told Starr's critic the removal provision was to be used "in only extreme, necessary cases," or it could severely undermine the public confidence in investigations of wrongdoing by public officials. The letter went on to say: "With respect to the allegations concerning Mr. Starr's political affiliations, there is no indication in any of the materials that Mr. Starr is unable to put his personal views aside while performing his duties as Independent Counsel," Shaheen wrote. "It would not be practical to require that Independent Counsels be selected only from among persons with no clearly expressed political opinions". The letter also dismissed complaints against Starr based on claims he had a conflict of interest because his law firm was involved in dealings with the Resolution Trust Corporation at the same time Starr was investigating an Arkansas savings and loan in the Whitewater investigation. CNN's Terry Frieden and John King contributed to this report.